below for another species that was first banded on our last day. Notes: MBO’s 2007 spring season, its third, has now come to a close. Migration seemed to come to a screeching halt the day after our last day of banding – enabling us to let out a big sigh of relief that we hadn’t missed too many late migrants. The week consisted of 3 days of full operation followed by 4 days of census only, the results of which reflected largely a breeding bird community, and not a migrating one. While there were no new species observed this week (just like last year), 3 new species were banded for this spring: Yellow-shafted Flicker, Indigo Bunting and Black-throated Green Warbler, bringing our total number of species banded during the season to an even 60. That leaves us just 3 species shy of last year’s total at this time. 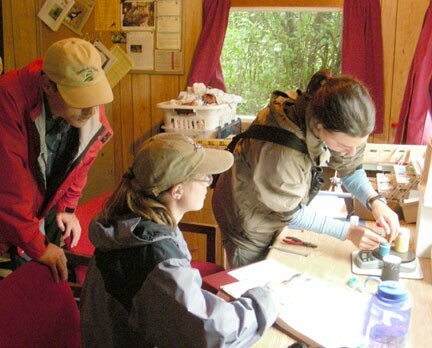 Benoît Côté and Heather Milligan look on as Barbara weighs a Yellow Warbler. On Thursday we were lucky to receive our second senior McGill visitor for the season, the chair of the Natural Resource Sciences Department of Macdonald Campus, Benoît Côté. He was given a tour of MBO, much like Dean Madramootoo, and was shown the basics of banding. We certainly hope he enjoyed his visit and wish him many happy returns to MBO. Our top ten species observed list is fairly similar to last week’s, reflecting the slowing of migration (and hence reduced species turnover). New additions include an influx of Common Yellowthroats at the start of the week, and the re-appearance of the Song Sparrow. However, the top spot again goes to the Red-winged Blackbird for the fifth week in a row. Notable differences from last year are the scarcity of Canada Goose, Ring-billed Gull and Mallard (ranked 2nd, 4th and 9th for this week in 2006). This may have to do with the fact that the fields next to MBO were planted this year and are quite long and green at the moment. The Bobolinks continue to burble on territory over these fields this year, indicating that they are now much more suitable habitat for grassland birds than for gulls and waterfowl. The top ten banded list was again upset this week with Red-winged Blackbirds falling to third position behind the Blackpoll Warblers and Cedar Waxwings. The warblers used the nice tail winds early in the week to continue their journey northward, causing them to decrease in number substantially. However, 4 still occupied the top spots (not counting the species tied for 10th spot with 1 individual banded). Only the top 3 of this week's top 10 were also on the list last year at this time, showing how different each year can be. We finished off this spring with 135 species observed; 13 less than last year. This is likely due to differences in observers on site, but could also be a true reflection of a decrease in species abundance on-site. More detailed summaries and analyses of the spring data will be presented in the full seasonal report, due out within the next month. Watch for our monthly summer updates at the end of June and July; weekly updates will resume with the start of the Fall Migration Monitoring Program in August. The table above provides a brief preliminary summary and comparison with previous spring migration monitoring seasons at MBO. It reflects both the consistency and inter-year variability that we have noticed throughout the season. 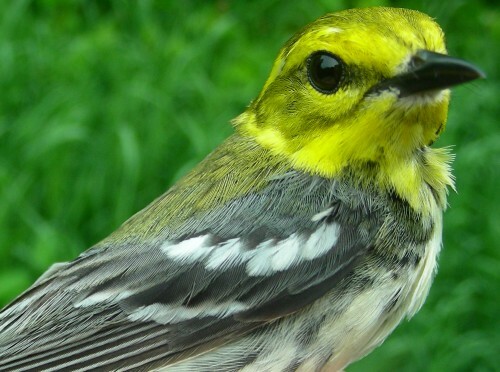 Six of the species (Red-winged Blackbird, Ruby-crowned Kinglet, American Goldfinch, Yellow-rumped Warbler, Yellow Warbler, and Common Grackle) have been among the ten most frequently banded birds each of the three years. Even these species vary considerably in abundance from year to year - for example, the number of Common Grackles banded dropped by over two-thirds from 2006, and while Red-winged Blackbirds were similar in number this year and last, they were far less common in 2005. The most notable changes this year, however, were the surprise abundance of Blackpoll Warblers late in the season, catapulting them to fourth place for the season, and the complete absence of Slate-coloured Juncos from the nets in sharp contrast to their fourth place status in 2006. Their drop-off can be partly explained by the banding season starting two weeks later this year, but even so it is a dramatic change. Similarly, the White-throated Sparrows that were consistently common in the first two years fell out of the top ten this spring, with only 13 banded. More analysis of these and other patterns will be explored in the full spring report. 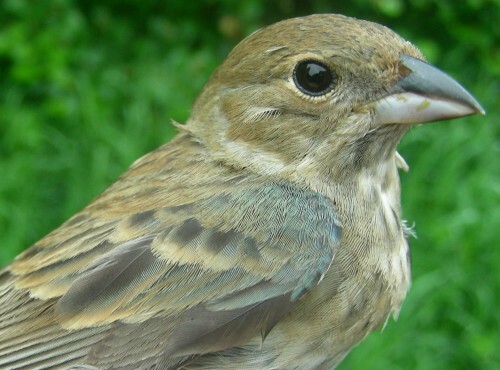 This after-second-year female Indigo Bunting also became the first of her species to be banded this spring. It’s no surprise that these late-comers were older females, as many passerines exhibit differential migration: young males head north earlier than the older males, which are followed by the young females, and the older females are the last to arrive. This is mostly due to the fact that the young males must seek out the best territories before the older males arrive if they hope to breed. Conversely, the older females can take their time, so to speak, allowing the males to duke it out before the females make the long trek northward.